The State of the Nation Address (SONA) is an annual speech given by the President as the Head of State which focuses on the current socio-economic state of the nation. This year, the State of the Nation Address took place on Thursday, 7 February 2019. The theme for this year's event was “Following up on our commitments: Making Your Future Work Better”. Read the full speech here. The President announced the five urgent tasks that are set out for government for the year ahead. The public participation role in the ceremony when the Civil Guard of Honour welcomes the President and his guests. The state ceremonial, which includes a 21-gun salute and the South African Air Force flypast. The official address by the President. Members of the South African National Defence Force (SANDF) will line the route that the President takes to Parliament. The Military Guard of Honour will participate in the ceremony and the military band will play South Africa’s national anthem. In a general election year, like 2019, 2 State of the Nation Addresses are delivered. The State of the Nation Address is one of the rare occasions where the 3 arms of State, namely the Executive represented by the President, Deputy President and Ministers; the Judiciary, represented by the country’s Chief Justice and the Judge Presidents; and the Legislature, represented by the Members of Parliament gather in one place. When is the State of the Nation Address happening? 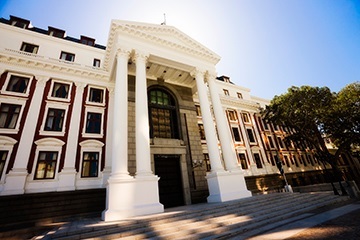 The State of the Nation Address (or SONA) will be delivered to a joint sitting of the two Houses of Parliament (National Assembly and National Council of Provinces). The State of the Nation Address will be broadcast live on DStv Channel 408, SABC TV, eNCA, SABC radio stations and Parliament’s YouTube Channel. The Government Communication and Information System (GCIS) will be hosting a number of live broadcast viewings of the State of the Nation Address on Thursday evening. You can view the live broadcasts here. The President sets out government’s key policy objectives and deliverables for the year ahead. It highlights the achievements and challenges experienced over the past year and maps the year ahead. It covers wide-ranging political, economic and social matters and considers the general state of South Africa. It deliberates on South Africa’s domestic affairs as well as its continental and international relations. The following is the list of road closures that will affect traffic in and around the city. What do South Africans want to hear at the State of the Nation address?